Ever since I moved to London in July 2017, I started eating Ramen at least twice a month. Why? Because it’s so delicious in London. In this post, I would love to share with you my top 5 incredible spots for the best ramen in London. And yep, these places will mostly feature tonkotsu, but other ramens were pretty great there as well! 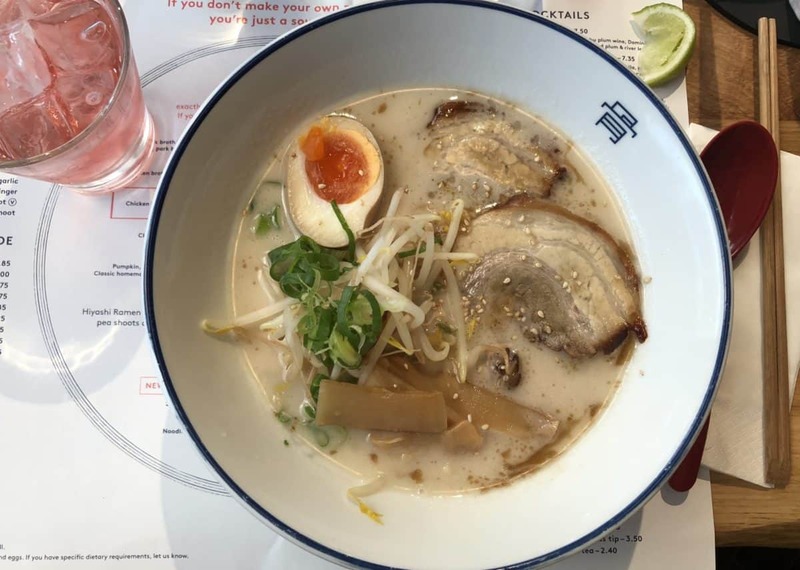 Tonkotsu in London is really good, so make sure to try it at least once! This place might not have a fancy Japanese name, but Ramen there is pretty authentic. It’s actually the first place where I’ve tried the authentic tonkotsu ramen (with a very thick pork broth stored for like 24 or 48 hours). Tonkotsu ramen has a very strong flavour, but I really really like it and suggest you to try it at least once. Bone Daddies has a central location (one of the restaurants is located near Picadilly Circus), nice room, good service, great ramens and tasty mochis! Also, I like the cool “rain coats” of Bone Daddies – you won’t ruin your clothes with your extra-thick soup, even if you spill it. Kanada-Ya is the best-rated place for ramen on Foursquare and the queue to get to the main restaurant of the chain is sometimes very long! Again, tonkotsu is really good there and I also found that it’s a bit more authentic than Bone Daddies. 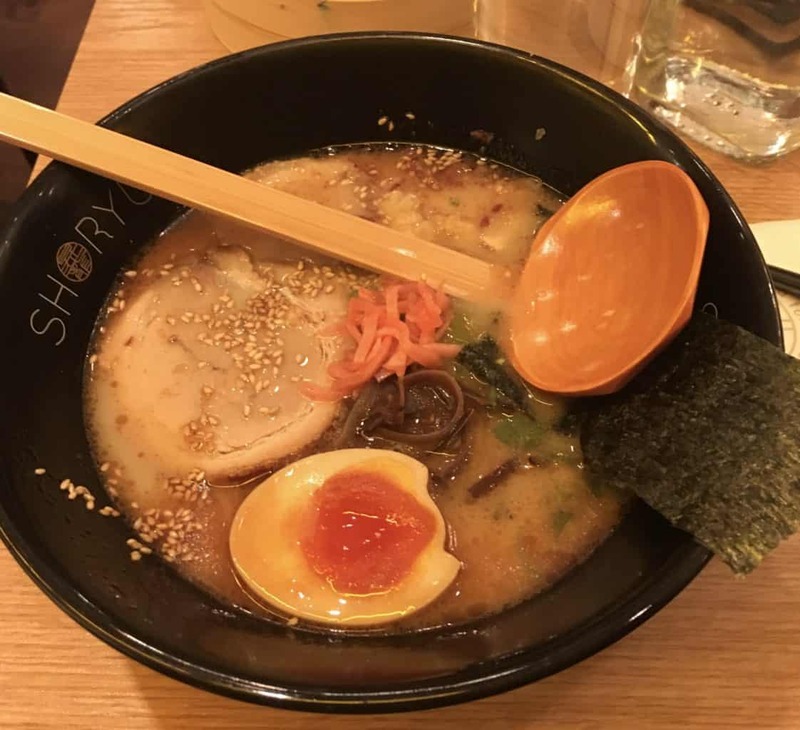 This is probably the biggest ramen chain in London – you can find Shoryu basically on every corner in central London. That doesn’t mean that ramen there is bad – it’s actually good! There are more ramens in the menu than in Bone Daddies, for example, but the differences between them are minimal. Tonkonsu Bankside is the only ramen place south of the river that delivers to our flat, so we decided to go for it and try it. To be honest, it’s not as thick and fat as Shoryu, but I actually liked it a lot. And the waiting times were super short! Also, there is a nice Tonkotsu restaurant near Battersea Power Station, so don’t miss a chance to try a really delicious ramen! And the last but not least in the list of the best Ramen in London is the infamous Japan centre! If you like Japan and Japanese food, this place is a Mecca for you. Ramen might not be their strongest side, but it’s pretty affordable and tasty as well. And of course, the best thing about Japan Centre is their fresh sashimi! Would like to read more posts about food in London? Check this post about the best brunch places in London! Liked this list of where to find the best ramen in London? Share it on Social Media!